Around the world there are billion of Android Lollipop users. There are lot of tips and trick available for Android Lollipop but most of the users don’t know about these tricks. If you want to add new user account then you have to unlock your phone. But this guide helps you to add new user account from lock screen on Android Lollipop. During locked screen of your Android phone you will be able to take photo, start video recording and also do emergency calling only. But you have to take following few simple steps to add new user account from lock screen on Android Lollipop. You will be able to easily add new user account or guest account on your Android Lollipop phone. 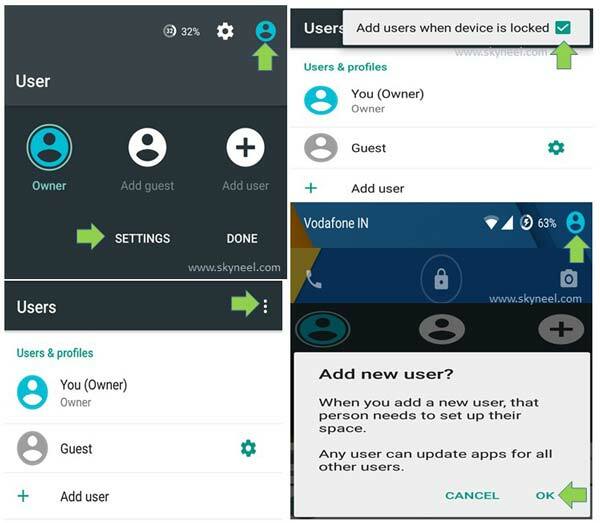 There are three types of users accounts in your Android Lollipop device : Owner, New User & Guest. Step 1: Turn-on your Android Lollipop in owners account. Step 2: Tap on the “Users” button from Home screen. Step 3: Tap on the “Settings” option. Step 4: Tap on the three dot button which is placed on top right corner. Step 5: Turn on “Add users when device is locked” option. Now, lock your phone screen. Step 6: Active your device locked screen and drag the “Users” button and tap on the “User” button. Step 7: Tap on the “Add user” button and tap on the OK button. Now new user account window shown on your home screen. Step 1: Tap on the “User” account. Step 2: Tap on the “Settings” option. Step 3: Tap on the three dot button. Step 5: Now you will again switch to the main user account. I hope after reading this guide you will be able to easily add new user account from lock screen on Android Lollipop. If you have any suggestions regarding this article then write us in the comment box. Thanks to all.